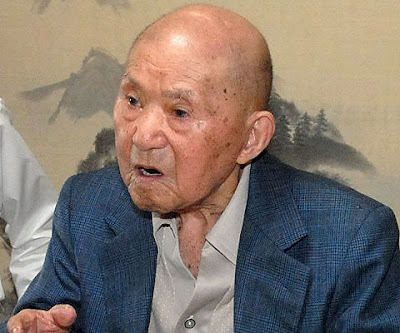 At 113 years of age, Tomoji Tanabe, from Japan, relies on a diet of fried shrimp, a glass of milk a day and no alcohol or cigarettes. "His favourite food is fried shrimp, but we've heard that he's cut back on oily food," said an official at his hometown of Miyakonojo, roughly 900 km from Tokyo. Japan has one of the world's highest life expectancy rates. This is attributed to a variety of factors including a "traditional healthy diet with plenty of vegetables. Japanese woman have topped the world's longevity ranks for 23 years, while men rank third after Iceland and Hong Kong."